Description : bt, legend, front., 6 p. [s.n. ], -424 p., [12 l.] pl. ; ill: 24 phot. figs., 12 facs. (part fold.) ; 18cm. Photograph : mounted albumen, composite of 24 cameo portraits. Photographers : Antoine-René Trinquart ; Pierre Lanith Petit (1831-1910). Subject : Medical biography — French physicians. Author caption: Par Paul Labarthe. Membre de la Société de thérapeutique expérimentale de France, de la Société des naturalistes de Paris, etc. Professeur libre à l'école pratique de la Faculté de Médecine de Paris. Founder of the journal, Médecin praticien. "Pour céder au goût du jour, M. Lebigre, notre éditeur, a bien voulu enrichir ce volume de vingt-quatre photographies." Labarthe was a successful writer and publisher of works in popular medicine – ouvrages de vulgarisation médicale – that were entirely ingratiating toward his professional peers. 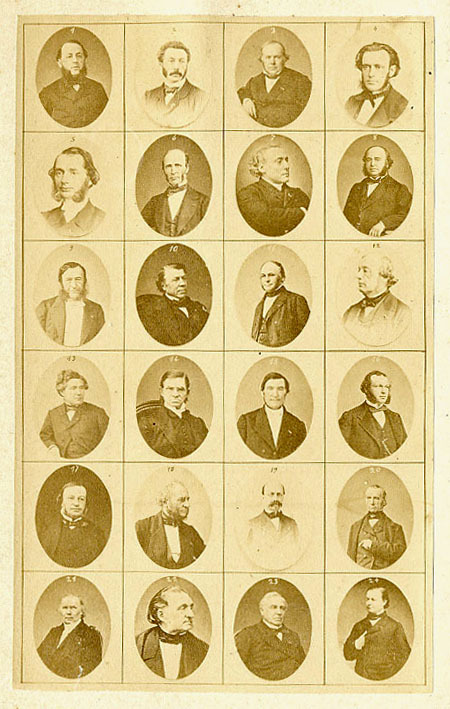 The photograph is a composite of 24 cameos, cropped from larger portraits by Petit and Trinquart, probably taken both before and after the date, 1862, when the two photographers ended their formal association. There are two versions of the composite, one where the portraits are arranged in a grid as shown here, and an earlier version where they are arranged in an oval.